Premise- Two teams of two family members compete in a series of four rounds based on the classic board game Scrabble. Winning any of the first three rounds won the team a prize and two bonus Scrabble tiles for the final round. The games played in the first two rounds are regularly rotated in each show. The games include Scrabble Knockout, Scrabble Babble, Scrabble Slam, Speedword, and Scrabble Scream. In the third round, Scrabble Flash, the teams are shown five letters and had 30 seconds to create as many words as possible with the letters given. The team who scored the most points in this round won the round. Before the final round is played, each team gets to select the bonus Scrabble tiles they earned during the show. Each team’s selection of Scrabble tiles will determine how many points each team will start with in the final round. In the fourth and final round, Scrabble Lightning, the teams will face-off against each other “round robin” style to solve unscrambled words based on the clues given. The words will be solved on a regulation Scrabble board with the Double and Triple Letter Score tiles removed. The first player to buzz-in with the correct answer to each word will be awarded the point value of the word. The first team to reach 100 points or more won the game and a grand prize trip to anywhere in the world. Before I begin my review, I want to point that this is not the first time the board game Scrabble has been transformed into a television game show. In 1984, NBC created their own version of Scrabble. 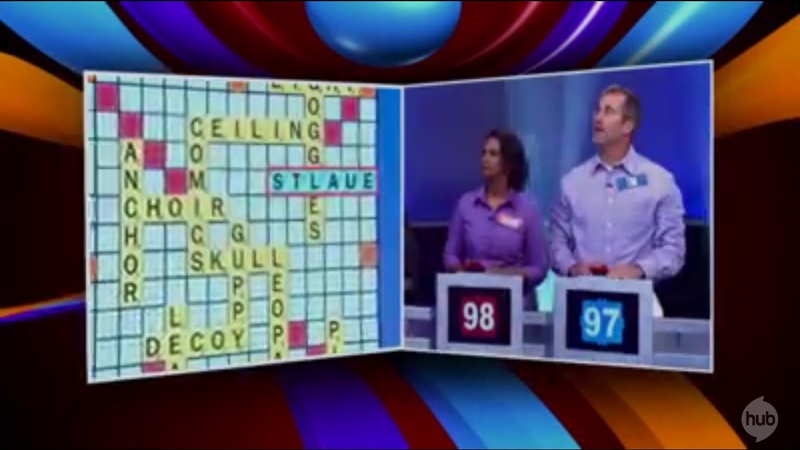 In this show, the contestants had to guess the mystery words, based on the clues given by host Chuck Woolery in an effort to win nig cash prizes. The series lasted from 1984 until 1991 and was revived in syndication in 1993 for one more season. Click here to check out an episode of NBC’s Scrabble from 1988. Scrabble Showdown lives up to its name as the show was billed as a “nail-biting, live-action game show [where] families use teamwork to solve a variety of challenging word games and puzzles that test their speed, spelling, and vocabulary”, according to a press release from The Hub network. The games are definitely challenging, creative, fast-paced, and require teamwork. From what I have seen so far, Scrabble Scream is one of the toughest games I have seen played on the show. It has been a while since I have seen a new fast-paced, competitive game show in the U.S. I like how the games are regularly rotated like on Family Game Night and on The Price Is Right to avoid stagnation in the show’s overall flow. I also like how the games are physically active and literally require contestants to be quick on their feet. Some of the games are tense and exciting to watch and sometimes comes down to the wire to determine the winner, especially in the Scrabble Lightning endgame. On a quick side note, Scrabble Lightning reminds me of the Speedword rounds on NBC’s Scrabble, without the unscrambled letters already in place. The only criticism I have about Scrabble Lightning is that the round could be a bit more challenging by putting in more difficult words for the adults to solve and by scrambling the letters better in each word. 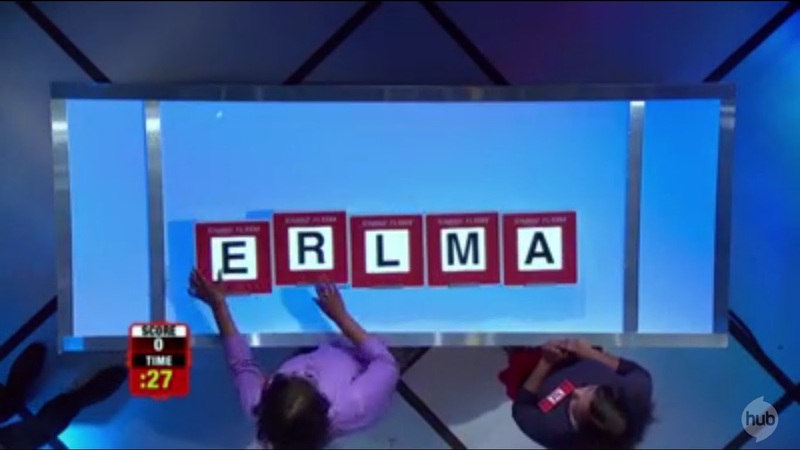 I have seen on more than one occasion where the first and last letters in some words were already in the correct position, which makes it easier for the contestants to solve the word. Justin Willman is a good host for the show, although I feel like he is a little bored with the show sometimes. He does a good job of making the contestants feel welcome on the show and keeping the show flowing at a consistent pace. Some of the other elements I like on Scrabble Showdown are the name tags. 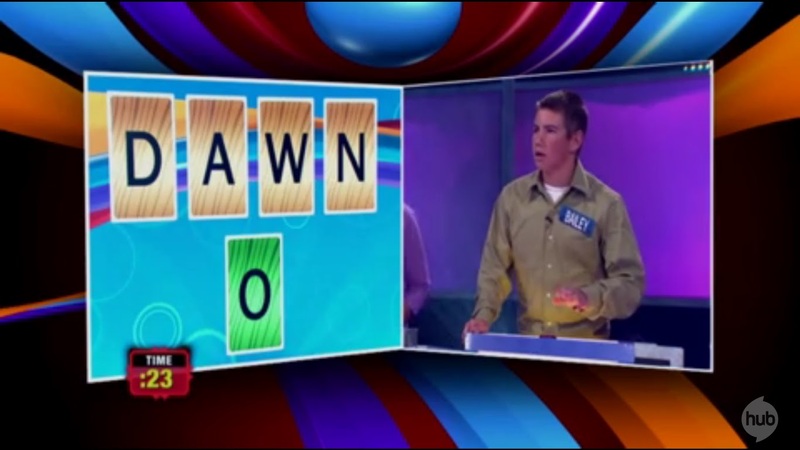 It may not seem like a big deal overall, but I like to see the names of who’s playing the game and name tags are almost non-existent in game shows today. I also like the show’s use of their prize budget, giving away nice prizes such as a PS3 package, video cameras, and especially letting the contestants choose where they wanted to go for their grand prize trip, should they win the game. The set design is pretty cool and spacious enough for the contestants to move around during the physical games. Overall, Scrabble Showdown is a great family game show that is fast-paced, active, and exciting to watch and play along at times. I like what The Hub has done with these board game crossover game shows. They are doing an excellent job so far and I am looking forward to many more shows that The Hub has to offer. Watch Scrabble Showdown on The Hub! Check The Hub’s TV Schedule for air dates! this is kinda interesting..i used to participate scrabble games in our school before..the game is pretty much enjoyable and it can enhance your brain..